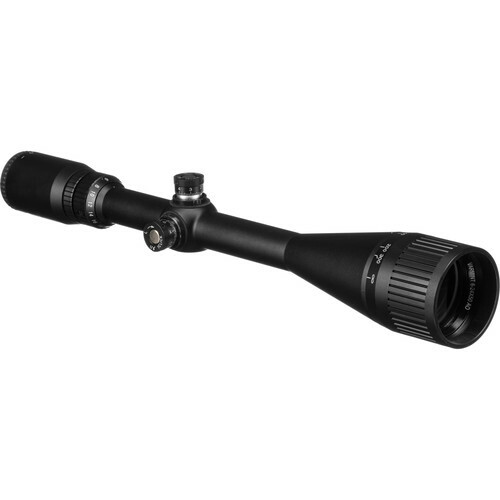 With a large objective and wide zoom range, the matte-black Barska 6-24x50 AO Varmint Riflescope is an ideal choice for long-range varmint hunting or target shooting in all lighting and weather conditions. Anti-reflection multi-coatings complement the aperture to ensure maximum light gathering and transmission for clear and crisp images with accurate color fidelity at dawn and dusk, or other challenging lighting conditions. It features an adjustable objective (AO) for precise parallax correction and quick access to the zoom and focus rings. To help get you on-target, the finger-adjustable turrets offer 1/8 MOA per click impact point correction, with 30 MOA of travel on both the windage and elevation to enable the wide correction range required with long-range shooting. Caps keep dirt and grime out of the turrets and unscrew easily. For those who prefer to avoid excessive turret use, or need to react quickly to changing circumstances, the second focal plane duplex reticle features mil-dots on both axes for simple holdover/under and lead or to estimate target size and range. Designed to withstand the rigors of the outdoors, the one-piece 1" maintube is made of a lightweight and durable aluminum alloy, with a reflection-resistant matte-black anodized finish. It is nitrogen-filled and O-ring sealed to be waterproof and resistant to internal fogging when moving through extreme temperature changes or conditions. Box Dimensions (LxWxH) 17.5 x 3.1 x 3.05"